The PostureWorks Silver Care Basic is the first general use wheelchair cushion made from Silver SpringTM an ultra-porous performance pad. The Silver Care Basic is easy to clean, extremely durable, and protects skin by keeping it cool and dry. The Silver Care Basic is the first general use wheelchair cushion wheelchair that can be laundered in a washing machine, making cleaning easy and ensuring that unpleasant odors are a thing of the past. Many traditional general purpose wheelchair cushions retain odors after being soiled; the Silver Care Basic cushion contains a Silver Spring(TM) core that can be easily and thoroughly cleaned and does not retain odors. In addition, the Silver Care Basic core naturally resists mold, mildew and bacteria to further assist with infection control. The Silver Care Basic core is extremely durable and comes with a three (3) year warranty. The Silver Care Basic provides uniform support over the buttocks, and retains its properties through repeated use. The Silver Care Basic contains ventilation channels throughout the cushion that enable air flow and keep skin cool and dry, helping to protect fragile skin. 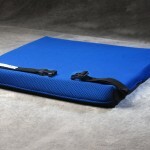 The Silver Care Basic cushion is comprised of a Silver SpringTMcore. This revolutionary new material incorporates an ultra-porous pad to provide a cushion core that is hygienic, durable, and easy to clean. The Silver Spring core can be laundered, enabling thorough cleaning and resisting bacterial growth. Silver Spring is durable and will retain its properties through repeated use and lasts longer than a typical foam cushion; the Silver Care Basic core is warranted for three (3) years. In addition, Silver Spring can be cleaned repeatedly while maintaining its efficacy. Silver Spring can be cleaned in a washer and is odor resistant, so your Silver Care Basic cushion will not retain unpleasant odors when soiled. The Silver Care Basic cushion is the first and only cushion designed for long term care facilities that can be laundered in a commercial washer. * Product must be maintained and cleaned using standard industry precautions. Washable – the Silver Care Basic is the first and only general purpose wheelchair cushion designed for long term care that can be laundered in a commercial washer. Because it is so easy to clean, and due to the unique Silver Spring core, the Silver Care Basic will not retain unpleasant odors associated with other traditional cushions. Durable – 3 year warranty – the Silver Care Basic core is incredibly durable and is warranted for three (3) years. 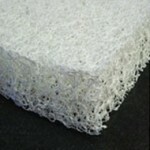 The core material was tested by the wheelchair labs at the Georgia Institute of Technology and demonstrated a significantly longer life than traditional foams.This means that the Silver Care Basic wheelchair cushion will provide protection for the user longer, and will provide a superior return on investment for the long term care facility. Comfortable – the Silver Care Basic provides a high level of comfort to people who spend long hours in a wheelchair, enabling them to spend more time, more comfortably, out of bed. The core of the Silver Care Basic provides stability that delivers uniform support over the buttocks and reduces areas of pressure. The Silver Care Basic general purpose wheelchair cushion is for higher functioning individuals who spend considerable time in a wheelchair and need a high quality cushion for comfort and safety. The Silver Care Basic wheelchair cushion is also for people who are incontinent or who perspire and can benefit from a cushion that provides excellent ventilation to help keep their skin dry and cool. WASHING MACHINE / DRYER: Entire Silver Care Basic cushion may be laundered in a commercial washer on gentle cycle. The cushion can be line dried. In the event that the Silver Spring curls in the wash or dry cycle, open the cushion cover and smooth it out the material before using the Silver Care Basic cushion again. SINK / SHOWER: Entire Silver Care Basic cushion may be cleaned in a sink or shower using warm / hot water and detergent; cushion may be line dried. WIPE DOWN: The Silver Care Basic cushion may be wiped down with a damp cloth for minor spills and cleaning. WHEELCHAIR WASHER: The Silver Care Basic cushion may be cleaned in a wheelchair washer.